Who’s this jerk (that is seriously cool)? This page looks really good! I love the expressions. I feel so bad for poor Helvetica. When will my REflection show WHO I am INSIIIIIIDE? Awwww poor guy. That would be the worst. On the upside, this new guy looks hard-boiled and pretty rad. Is it just me, or does he look just like Helvetica but taller? Very much so. To be fair, skeletons don’t have a lot of distinguishing features. What do you mean -climb- all the way up? How else was he supposed get a peek at the lake? There wasn’t any cable car or tour bus we could see. I just realized something terribly sad. You could meet your dead husband or brother or friend in this world and not even know it. It’s not like they’d look the same, or have the same name. I thought that at first too, but the two other main characters look very much different. But still, it could be just that lol. It’s not easy to make skeleton fish look adorable, but you’ve pulled it off masterfully. I just found out about this comic and I’m already a fan! 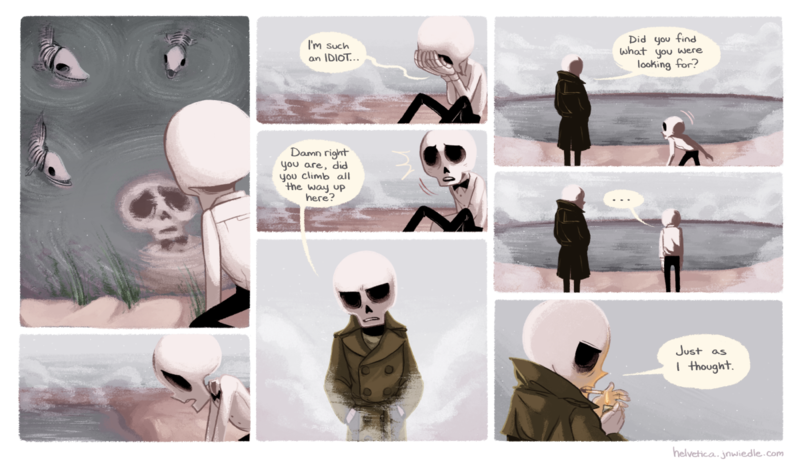 …And it also made me acquire a strong liking for skeletons. Damn that Bogart guy is one enigmatic mamma jamma.